I'm not sure that experience of working on Spielberg's version of Tin Tin has rubbed off on Moffat. 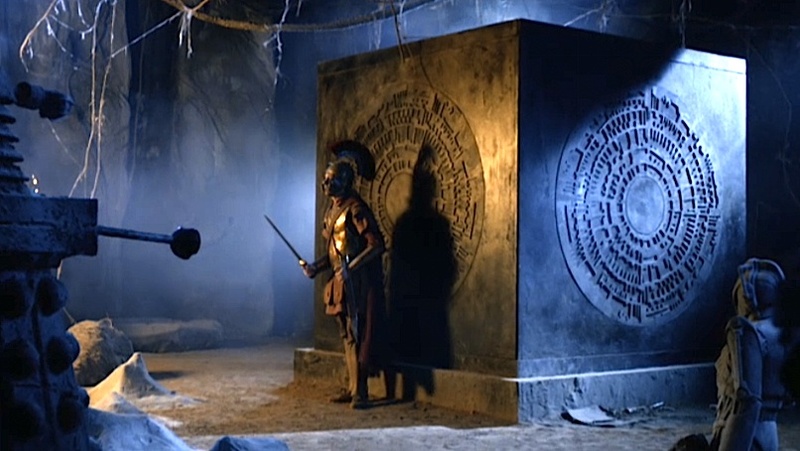 The Pandorica Opens more or less amounts to a gene-splicing of the Devil's Tower sequences of Close Encounters and the catacomb exploring of the Indiana Jones films and looks very pretty but I'm not convinced on this evidence he can do 'epic' in Doctor Who. 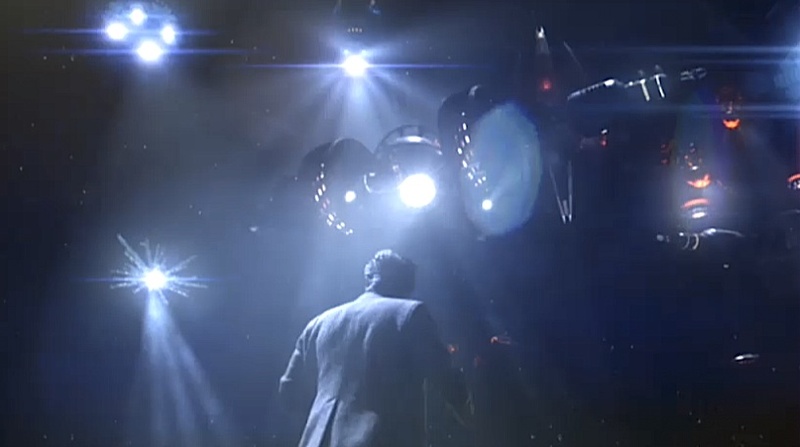 The narratives that hold these glossy visual spectacles together are really what Moffat is interested in. The rest is a bit tokenistic. The two part story that concludes with The Big Bang also reflects an ancient literary tradition that you could say Spielberg himself has deliberately woven into many of his major films. It falls into the tradition of menippea - a form of satire that signifies a mixed, often discontinuous way of writing that draws upon distinct, multiple traditions. Both The Pandorica Opens and The Big Bang act as reflections of each other, at once proposing an anti-epic visual presentation in counter-point to an epic narrative. From the sky full of spaceships above Stonehenge to the alliance of monsters with their rather ridiculously contrived plan to trap the Doctor in the Pandorica, Moffat turns the whole thing on its head and in the The Big Bang simply has four people chasing around a museum whilst the universe shrinks outside the window and the Doctor cheats willfully with the time lines, bouncing around like a deranged cosmic Tommy Cooper. Bakhtin regarded menippea as 'the use of the fantastic internally motivated by the urge to create extraordinary situations for the testing of philosophical ideas'. Which sums up the finale for me and Moffat's own view of the entire Doctor Who series synthesised into a carnivalesque ambivalence for logic, an irreverent desire to break the rules and to cross boundaries. Sometimes it works spectacularly - not just in terms of visual spectacle but also in narrative complexity - and sometimes it's a way for him to cheat, avoid the implications of what he's done and refuse to answer questions left dangling by the preceding 11 episodes. Thus we get no real answers to who was saying 'silence will fall', why the TARDIS was exploding and a reasoning for Amy's 'special' status. And presumably the missing ducks from the Leadworth duck pond ended up on the other side of the crack in time. 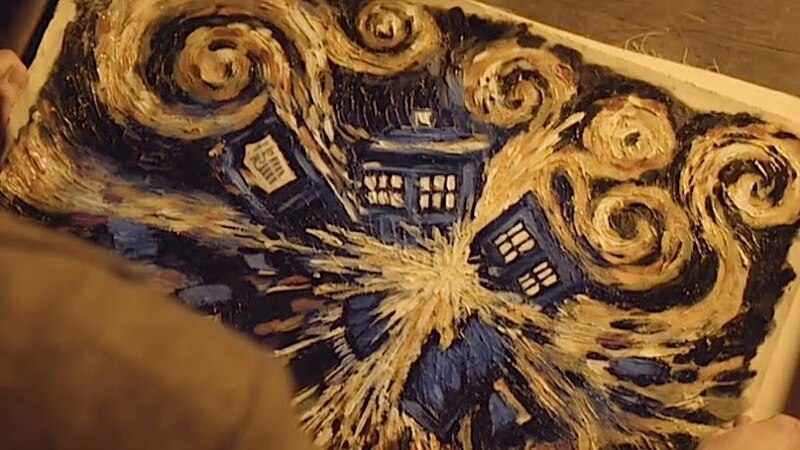 Moffat knows his game and in the opening sequence with Vincent in 1890 he's clearly sending himself up rotten when the neighbour attending with the doctor looks at the painting of the exploding TARDIS and mutters, 'Look at this, even worse than his usual rubbish'. Moffat's end game with this finale is to focus in on the triangular relationship between Amy Pond, the Doctor and Rory Williams. The messages carried through time via Van Gogh's painting, Churchill's telephone call, Liz Ten's meeting with River after she has broken out of the Stormcage facility are simply a means to an end whilst also cleverly rewarding the patient viewer with the pleasure of recognition in these pre-titles revisitations. They throw out a number of questions that in typical Moffat style aren't likely to be answered - why is Liz Ten still alive in 5154 and why is Bracewell still working for Churchill when it was more than suggested at the end of Victory Of The Daleks that he was off in search of his true love, Dorabella. These are, like many other sequences in the story, narrative conceits. 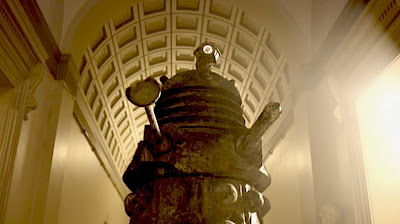 The Pandorica Opens is in effect one massive conceit. The significance of the Pandorica and the exploding TARDIS drive the story but in the end we never really discover the answer to the latter and the former is inevitably not what it seems with much of the episode heavily signposting the fact that it's a prison cell into which the Doctor is dumped by his enemies and not the home of an ultimate 'big bad'. 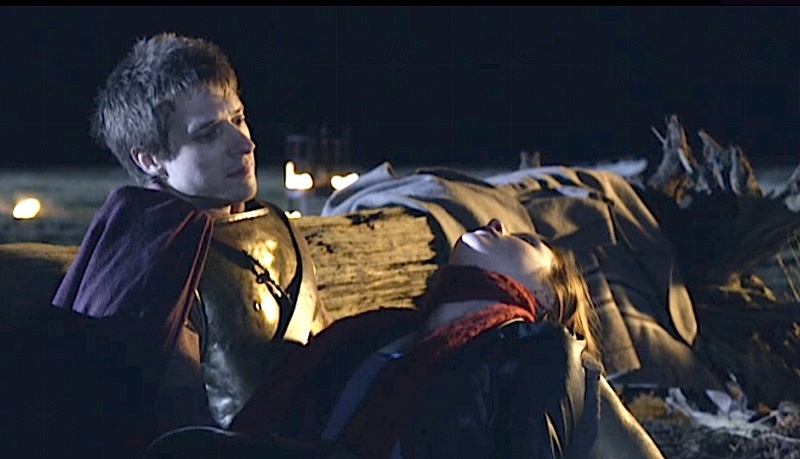 The most effective twist in The Pandorica Opens is the resurrection of Rory, presumed erased from history at the end of Cold Blood. His reappearance is another layer to the themes of the series about remembering and forgetting and, significantly, he isn't the real Rory but a facsimile, a memory of Rory, created by the Nestenes. They presumably replaced the real Rory who did die at the end of Cold Blood. Or was he an Auton right from his introduction in The Eleventh Hour, then destroyed in Cold Blood, and then resurrected in The Pandorica Opens? It is narrative obfuscations such as these that Moffat deliberately ignores or refuses to clarify. Rory is that most human of non-humans, embodying the crisis of subjectivity at the heart of this revelation. He struggles with his Nestene programming and conflicting human emotions, just as Amy evoked the same contradictions in the Dalek's android Bracewell back in 1941, to reaffirm his love for Amy, only to then destroy the object of his feelings. 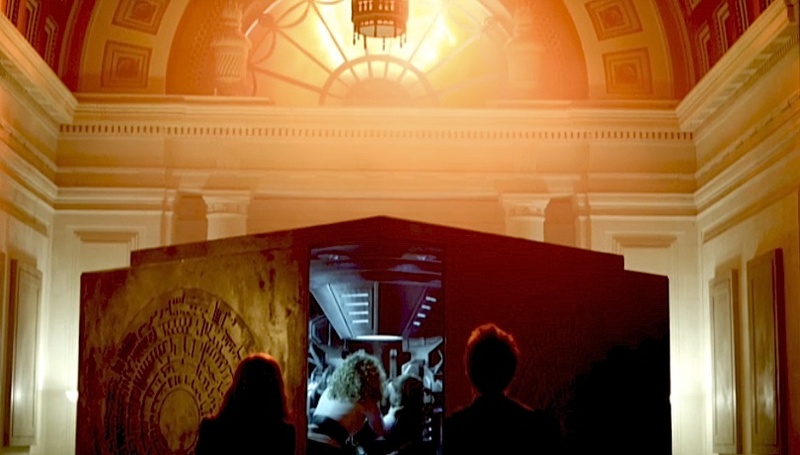 That this death takes place simultaneously with the Doctor's capture and imprisonment in the Pandorica, the destruction of the TARDIS and the death of the universe offers the spectacle a much needed emotional grounding. 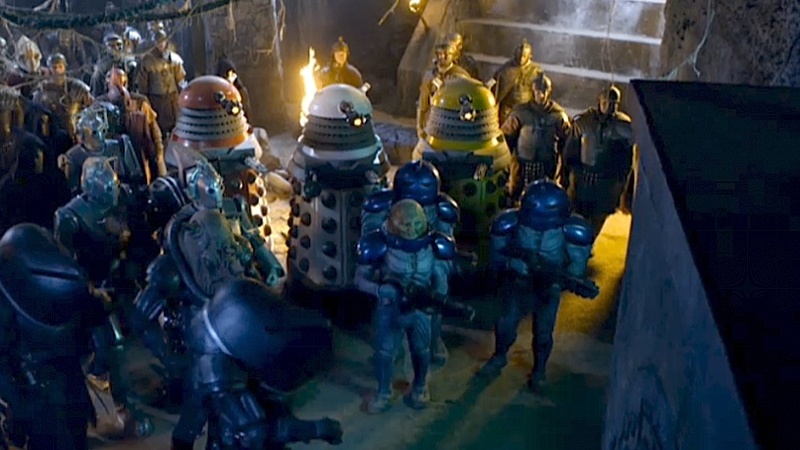 Rory's non-human status and his subsequent murder of Amy is the single most powerful scene in The Pandorica Opens and legitimises what is in effect a Doctor Who episode that resembles a Busby Berkeley tap routine performed by a sweating Steven Moffat sporting a fixed grin. It's hard to be 'epic'. Moffat uses such conceits to again fuel the narrative expectation in The Big Bang where the audience is given a linear narrative - of the Doctor escaping from the Pandorica and the dead - now alive - Amy taking his place - that is broken into non-linear and often repetitive moments, planting visual and verbal information about scenes that haven't happened but will happen or that have happened and we don't know why they have until the explanation appears further along the narrative. He's testing our ideas about time and the use of empirical and metaphysical paradoxes in the science fiction genre. For me, however amusing it is, and - in the way Matt Smith performs these sequences - it is, it really amounts to more grandstanding, including the revitalisation of the Dalek as a token monster to chase our heroes down corridors, that delays the story getting to the roof of the museum and the ultimate fate of the Doctor, the Pandorica and the TARDIS. What's more interesting in the story are the binary oppositions between men and women. Amy truly is the fairy tale figure of the mysterious Little Red Riding Hood that the series has been constructed around. She is not only the absent woman in search of her self, her journey starting as a girl, with the adorable Caitlin Blackwood returning as the younger Amy, and continuing through to impending womanhood and that wedding but the story is also a science fiction satire about getting the bride to the church on time, about getting the adolescent Amy married off. Typically, the finale also underlines of some of the problems I've been having with this series. Firstly, the series as a whole has evidently suffered from a cut in budget. This is unfortunate because television is a visual medium these days and you need to spend money on it to engage audiences. Otherwise, you might as well do all this on the radio and a great deal of The Big Bang might as well have gone out as an Afternoon Play on Radio 4. No matter how much of a clever clogs Moffat is, he can't just rely on characters running around a museum engaging in time travel screw-ball comedy to define the nature of the threat to the audience. The difference here to Series Three or Four, for example, is the inward and insular way Series Five has been structured around Amy and the Doctor, including the world in which these characters are seen to exist and the way they counter the threats to this world. There is less show and more tell in many of the scripts with, I'd argue, only The Time Of Angels/Flesh and Stone really achieving the winning mix of the epic and the personal that uses the visual medium of television well. 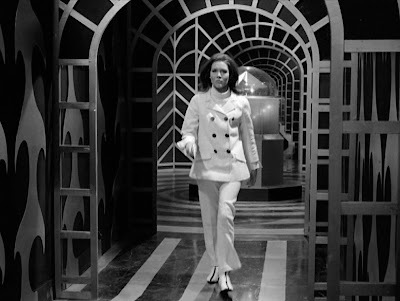 There are undoubtedly instances where location filming abroad has paid off, as in the Vampires Of Venice and Vincent And The Doctor, and the threats have been placed on a broader canvas (unlike the exploding TARDIS which is only ever seen on a canvas). On the whole I get a sense that the world building that's so necessary for a high concept series like Doctor Who is being presented to us in shorthand. If you look at The Pandorica Opens the money has clearly been spent on the Stonehenge locations and the visual effects. By the time we get to The Big Bang the Stonehenge location is gone as is the visual misdirection of the massing alliance space fleet and what was indicated as threat has, ironically enough, become as fossilised as the remaining Daleks (no doubt another addition to the Character Options range). The Big Bang tells us about the threat to the universe but never actually reveals why it is there in the first place, why it is happening and who caused it. It's an unsatisfying finale because we never have a 'big bad' on which to pin the focus of the story. That conflict is absent and the Doctor spends most of The Big Bang fire-fighting whilst Moffat brings the story of Amy full circle. Much of the series has therefore been set within a self-referential bubble, with the effects of conflict on those outside that bubble all happening off screen. We're told about the consequences from the Doctor, Amy and Rory but we never really see it actually affecting other people. As the TARDIS burns itself out we get the barest indication through dialogue that Richard Dawkins is slightly concerned about the shrinking of history and the lack of stars in the sky. These are powerful concepts that Moffat is creating but I keep feeling I'm being placed at a distance from them and I am only allowed to hear about them, never mind see them, through Amy or Rory. You have to have very strong, very identifiable supporting characters to be able to pull that switch from the broadest to the narrowest world view and to convince an audience that the apocalypse is mostly taking place off screen. 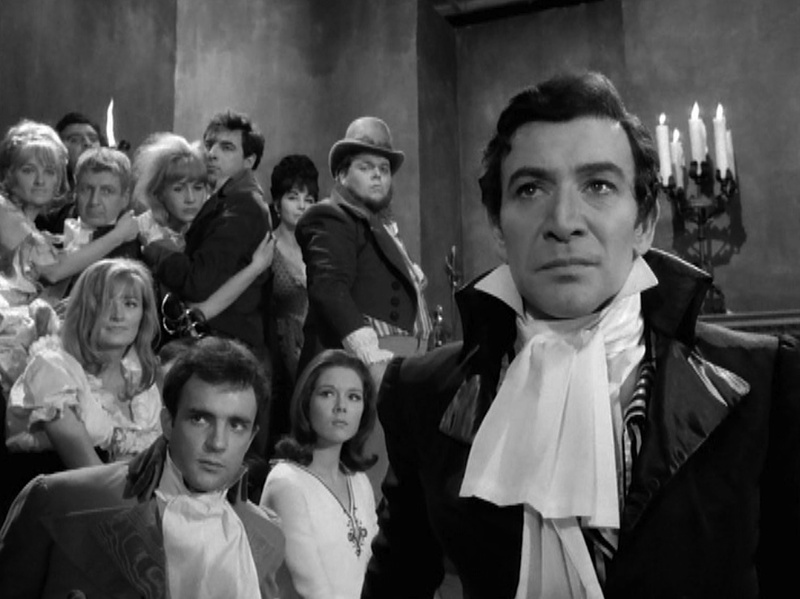 Although RTD's use of his characters families and the extended repertoire of supporting characters in Harriet Jones, Captain Jack et al might be seen as too much a reflection of soap opera, the audience accepted that world view because of its familiarity and because the conflict between the Doctor and the villain of the week was often staged on screen in familiar surroundings, often showing us the consequences. In the end we are left only with Amy and Rory as the audience identification figures and there isn't enough context to care about the threat to them and to us, as the audience. I've stopped caring, to be honest, because the series won't let me care. Secondly, try as I do, but I don't much like Amy. 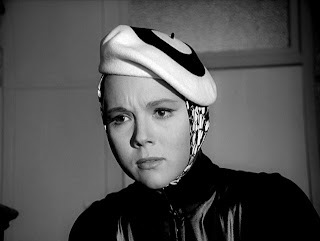 I find her a rather unsympathetic character. It culminates with her finally waking up on her wedding day and getting married. How do we accept that Amy then casually waves goodbye to parents that she's desperately fought to bring back into existence, and who occupy a minimum of screen time, as she and Rory abruptly leave in the TARDIS. We don't even see them wave back! After all the reunions, I find it rather callous of her to reject that new world with her parents in it, and after restoring the Doctor through the power of suggestion, to spend her honeymoon with him in the TARDIS. Has this woman an obsession about father figures? I'm afraid there's a whiff of a straight male fantasy (the kissogram's a bit of dead giveaway) deliberately being projected onto the character possibly as as an extension to Moffat's own fantasies of a woman who doles out a form of sadomasochism to the men in her life. 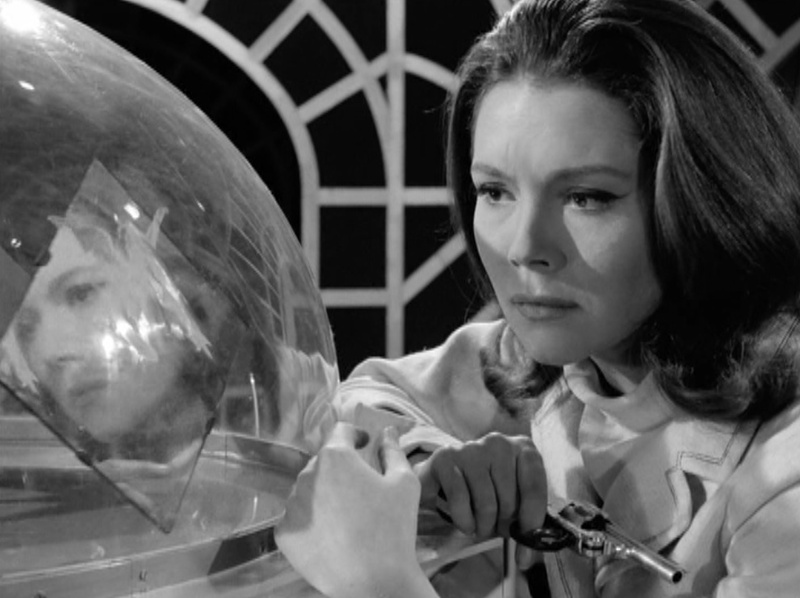 Moffat and Moffat's analog, Rory, bask in the power of a strong, controlling woman. Amy as the idealised woman, ironically, may both evoke in them the feelings of safety and protection associated with childhood and likewise from which Rory, and by extension Moffat, may derive satisfaction from earning the approval of that figure. Very much a case of bringing yourself to what you write I think. 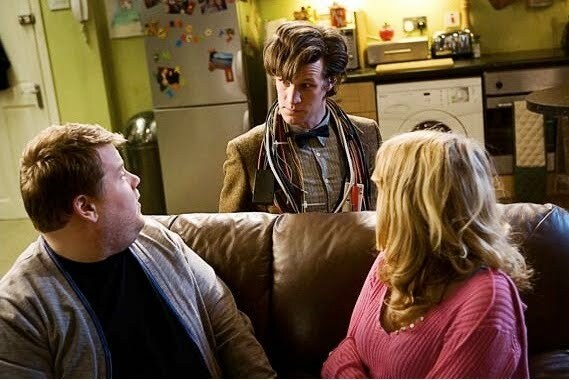 Amy spends a lot of time belittling both the Doctor and Rory, trying to dominate and to an extent emasculate them (her attempt to seduce the Doctor is clearly an extension of that but he's strong enough to reject it) and it is very telling when, at the wedding reception, the Doctor congratulates Rory with, 'From now on I shall be leaving the kissing duties to the brand new Mr. Pond' after Amy has ordered the Doctor to 'kiss the bride'. 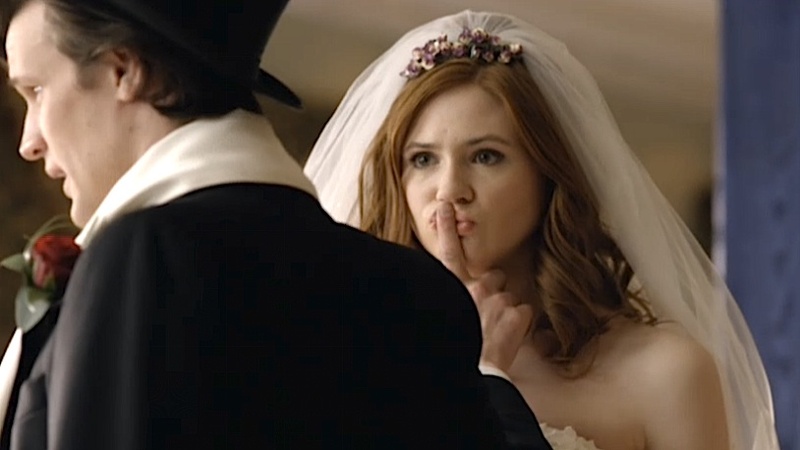 Here, the Doctor firmly rejects her dominance but also confirms that Rory is no longer Rory Williams but Rory Pond. 'No, I'm not Mr. Pond. That's not how it works.' 'Yeah it is' confirms the Doctor with Rory's status underlined as victim of his own self-defeating personality disorder. Rory is for me the best thing about The Pandorica Opens and The Big Bang. As I said, he's the Moffat analog and in being such is a far more humane character, even when he's an Auton, than the horribly idealised Amy Pond. This is the plastic man that hangs around for 2000 years protecting the Pandorica, marries the woman inside it and settles down to a life of hen-pecking in the TARDIS. He's a man who engages in excessive self sacrifice in order to get a response from the woman who allegedly loves him and then happily takes the humiliation from Amy when he is reluctant to find any pleasure in all the dangers that travelling in the TARDIS throws at him. 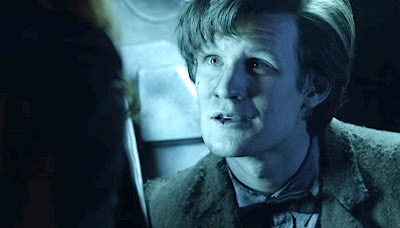 He's a deeply flawed man whom most of us can relate to - 'the boy who waited' guarding the gift of hope in the Pandorica (definitely symbolically similar to Pandora's box itself) and who emerges into manhood. The finale is flawed, lacking a really decent conflict between the Doctor and whoever it is that caused the TARDIS to explode and told us 'silence will fall', but they are good, solid and entertaining episodes. The scripts are witty and full of life even if Moffat plunges into self-indulgence in The Big Bang. The death of Amy at Rory's hand, literally, is the pinnacle of The Pandorica Opens whilst the allegedly show stopping gathering of the alliance of monsters is just a sop to keep the kids happy (and bearing in mind my thoughts about the budgetary necessities of the anti-epic, how must they have been disappointed to find it all reduced to one pathetic Dalek screeching for mercy in The Big Bang?). The Big Bang is more satisfying emotionally with it being the conclusion of the series long Amy arc. The stand out scene between the Doctor and Amy, the conversation with her as he prepares to hurtle into the heart of the burning TARDIS, is one of the best of the series. 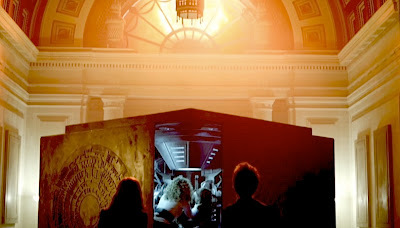 It adds the full stop to the whole series subtext about remembering and forgetting that has been drip fed into stories from the beginning and the notion that the Pandorica ultimately symbolises hope after both forgetting and remembering, much as in the ancient story of Pandora, even if it does stray rather too close to a big reset button. Moffat's story arc, in which all of history is erased and then rebooted, in which the very act of remembering is a macrocosmic event (the key to saving the universe) - and a microcosmic event (bringing back your long vanished parents) is surprise, surprise a main tenet in fairy tales. Amy's Red Riding Hood journey through time, symbolised very powerfully in the forest scenes in Flesh And Stone, is one about avoiding the threat of being devoured wherein the hungry wolf of the old fairy tale is now the crack in the bedroom wall. But like many readings of fairy tales, is this also a story about a girl's desperate avoidance of womanhood, her impending marriage to Rory, and to remain a child by jumping aboard the TARDIS to avoid the predations of the wolf (Rory and the crack in time)? Might this explain her defensiveness to Rory in some of the earlier stories? The interesting thing about Red Riding Hood and other fairy tales is that they are concerned with the control of women, the control of desire. Amy as a Red Riding Hood princess whose final trajectory is marriage is a fascinating reading of a transgressive woman, acting on her own desires but who in the end must be rescued by two friendly male figures - Rory and the Doctor - the husband and the father. River, cycling through a number of identities and appearances - from earth mother to seductress - is positioned here as a trickster heroine and as literally, the figure of the old wive's tale, the woman as storyteller and an analog to Scheherazade, as one who spins her narrative ('spoilers') throughout the Doctor's timeline. Plus, of course, she's his wife and by extension she's symbolically Amy's wicked stepmother. As ever, Matt Smith completely steals the show and is particularly impressive in The Big Bang, giving us a mesmerising range of performances within one episode, capturing ancient wisdom and youthful recklessness in one big eccentric package. He truly is the biggest success of what I think has been a fairly middling series this year and remains the sole reason for continuing to watch the show. I have no problem with Karen Gillan's abilities but I'm hoping that now we've got Amy married off the character will acquire some warmth and sensitivity. The themes in this year's series about the journey from childhood to womanhood didn't quite make it across in the performances until the very end of the series. Less flippancy and that awful shouty emphasis she puts on the ends of certain line readings would also help. I'm very pleased that Rory appears to have permanently joined the crew. He is the 'everyman' figure that the series must hold on to and Arthur Darvill is completely charming in the role. Now all we need are better monsters (the new Daleks and Silurians were design disasters in my opinion), decent scares and better realised worlds as a context for the journeys the Doctor, Amy and Rory go on. Christ, you can smell the testosterone from here. Or perhaps not. Perhaps it's that new Lynx fragrance 'Monkeys, Monkeys'. Or the smell of omelettes. Ah, I wondered when we were going to get to this point. Let's face it, when you've got Messrs Moffat, Nye and Curtis all lined up and writing for Doctor Who by the law of probability someone was bound to introduce the whole crisis of modern masculinity schtick into the series at some bloody point. All three writers have, during their careers, paraded a number of male characters across the screen with many of them desperately attempting to come to terms with the modern man's place in a rapidly changing culture. Traditionally, scripts from all three writers have had an emphasis on the burdens of masculinity or the crisis of male identity which have been examined with humour and irony but from an essentialist point of view which presume that there was and still exists a relatively stable masculine 'essence' that defines men and distinguishes them from women. This essentialism was one that was then reconstructed as an extension of the media created New Lad or New Man. Here, we're in the post New Lad territory of the metrosexual 'caring' man struggling with his sense of self-esteem and a severe case of unrequited love. It is the centre of a script that frames the traditional tropes of male behaviour ('I'm a normal bloke. Tell me what normal blokes do.' 'They…watch telly, play football, they go down the pub.' but looks at them from a slightly different angle. That's because the writer here is Gareth Roberts, adapting the story he presented in the comic strip of the same name where the Doctor and Mickey do the whole flat share thing. 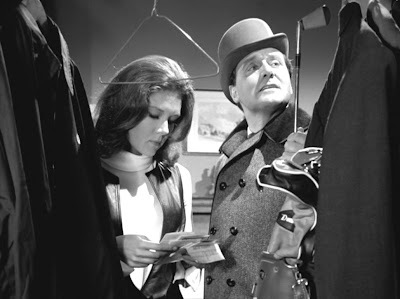 Whilst it's clear that Roberts is having immense fun exaggerating the Doctor's eccentricity within the domestic human context of a flat share, you could argue that this urgent desire to emphasise how eccentric the Doctor actually is out of his natural habitat. It somewhat contradicts his history with, and knowledge of, Earth, including his long period of exile where he was seen regularly hobnobbing with politicians and scientists, scoffing their cheese and draining dry their wine cellars. An amusing reference to Pertwee singing in the shower reminds us of that previous Doctor's vast experience with human lives that Roberts rather conveniently puts aside to raise the script's comedy stakes. 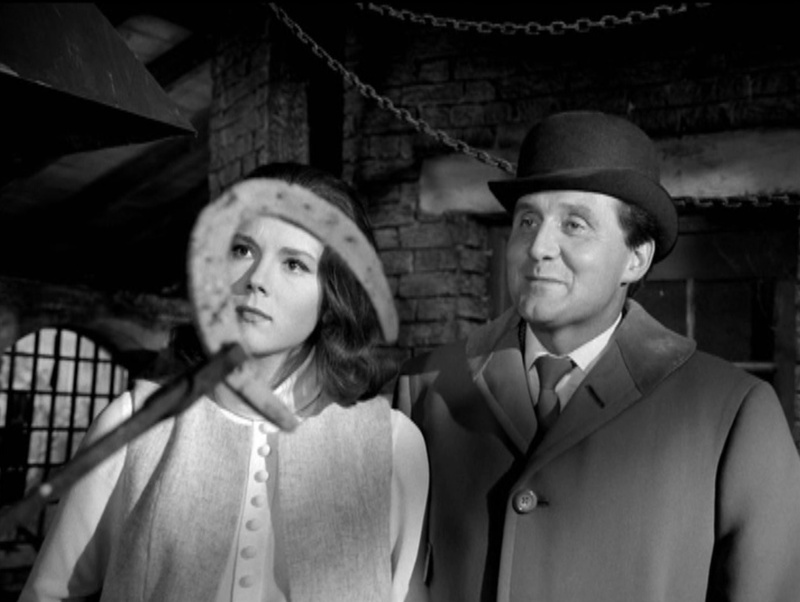 Roberts is also perhaps too busy churning out the charming sit-com romantic triangle between the Doctor, Craig and Sophie, that highlights how the alien Doctor is actually the epitome of humanism even though we already knew that, to recognise that he delays for too long the Doctor's solving of the mystery, allowing several nasty deaths to occur whilst the Doctor is cooking omelettes and building scanner devices out of bric-a-brac. This is one of the major problems with the script along with the fairly rushed ending. For all the 'fish out of water' humour, the Doctor's reasoning and behaviour is shown at its most illogical here and the script tantalises, rather infuriatingly, with the mystery of the TARDIS-like time-engine and its unknown owner or owners but then goes no further. Despite these problems, the set up is interesting and the threat from the man upstairs is wonderfully evocative as he or it lures in his victims one by one. The disturbing thing is that he or it uses a number of disguises, all equally suspect, to lead them to the slaughter. 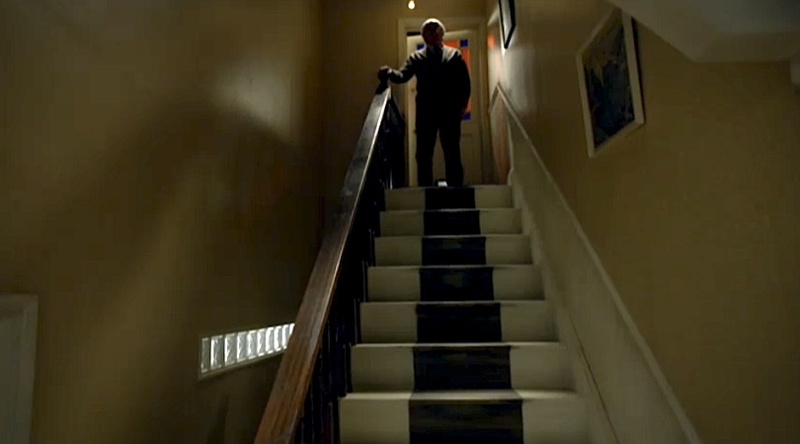 There's a slightly unsavoury aspect to the first sequence where the ship's autopilot lures in the young Leonardo Dicaprio lookalike and as he innocently mounts the stairs his doom is clearly in the hands of an older, more mature man who awaits his arrival. Later, what looks like a prostitute dressed like Donna Summer and someone from Eastenders are given the routine from the emergency auto pilot thing and are reduced to damp patches on Craig's ceiling whilst the Doctor diddles about nattering to Amy, who seems to spend most of the episode hanging from a trapeze, or he indulges his male bonding with Craig by playing football. 'You're weird and you can cook. That's good enough for me.' admits Craig and in doing so he pretty much sums up how many heterosexual and homosexual partnerships get off the starting blocks these days. The suggestion here is then further compounded by Craig's explanation of the customary arrangement between the flat's male occupants. 'In case you want to bring someone round' says Craig. 'A girlfriend…' and then Craig looks the Doctor up and down and crucially appends 'or boyfriend' to frame the relationship between the two men as one of male homosocial bonding with the dynamic for the Doctor's inferred homosexuality framed within that. 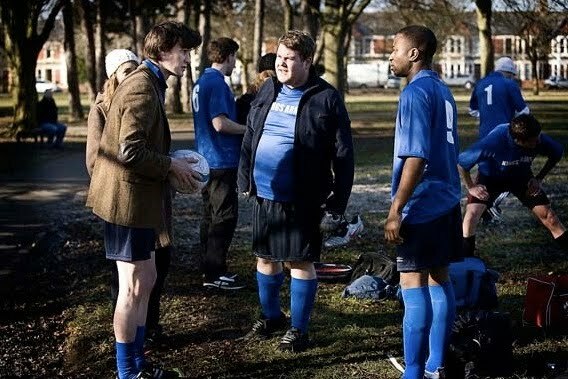 The episode surfs along with many references to these themes and ideas with Roberts using the differences between the Doctor and Craig to deconstruct some of the masculinities on display and the wider questions of change and continuity in contemporary identities. When we first see Craig and Sophie and they discuss the flat share advert, Sophie offers Craig a 'mission in life. Find me a man!' which he inadvertently does in the form of the Doctor and, whilst initially too reluctant to share his feelings with her, he increasingly feels his chance has gone simply because the Doctor has opened her eyes to how she can widen her horizons and escape her suburban rut. It's interesting that, even though it is done as a humorous contradiction, Craig bursts out of the front door yelling 'I love you!' at the Doctor, a mock declaration of the love that dare not speak its name. At first rather taken aback by the Doctor's rather unmanly behaviour (the double air kisses and the Doctor's compliments on Craig's taste in decoralso connote the episode's witty view of metrosexual, suburban mores) Craig's initial discomfort switches to a sense of defeat when the Doctor demonstrates that he is better at the things Craig does - the things that define him as a man. The Doctor might be weird and wear a bow tie but in the end Craig feels inadequate as the Doctor presents his abilities as a footballer and as a temp where Craig works and even as a man who can seemingly relate to women better when he convinces Sophie of her potential. The whole issue of men and work is explored with Craig's job. In a culture of recession, downsizing and market driven policies, he represents the rising occupational insecurity and sense of precariousness in the male workforce, especially when he finds the Doctor sitting in the office. There is a sense that when Craig turns up for work after the Doctor's gentle, almost feminising, administrations to his sickness, that he is immediately emasculated by the Doctor's further interruption into his working life. He has seemingly usurped Craig, is clearly using his intellect and charm to influence company policy, tell awkward customers the way things will be from here on in and is generally being praised by Craig's boss. Perhaps doing all the things that Craig himself secretly desires. 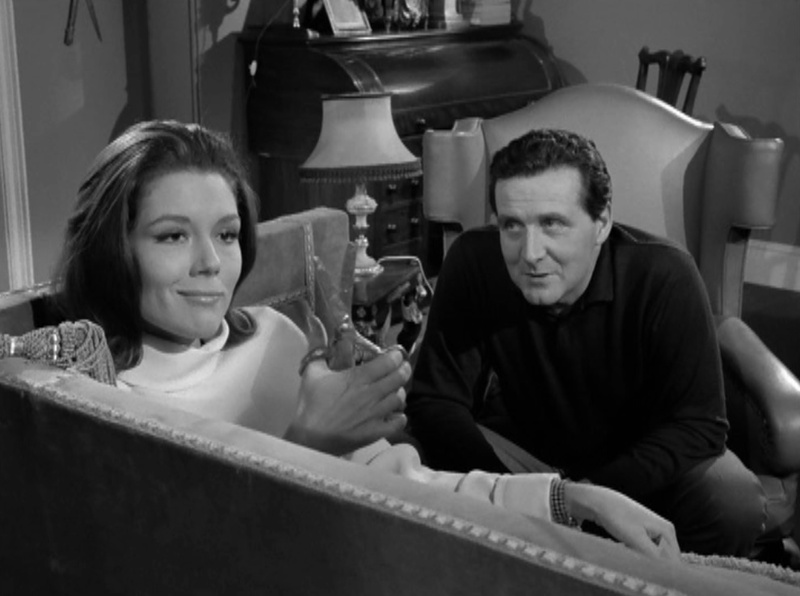 The episode also explores further notions about men, fear and weakness. Craig puts a brave face on the world, disowning his fear of rejection and yet he's weak enough to capitulate to it when faced with his relationship with Sophie. He regresses from intimacy as much as she does and this is only resolved at the end of the episode when their survival relies completely on the expression of their desire for each other. The regression and repression that Craig is acting out is also the very thing that protects him from the time-engine's search for a pilot. His seeming contentment with the status quo is at first challenged by the 'man' upstairs when the noise of what he does to his victims disturbs the male flat share but he is again rejected ('Thank you, Craig. But I don't need your help') by the threat. The time engine and its pilot emphasise his entanglement in the roots of suburbia and his lack of ambition beyond 'beer, pizza and telly'. Is he man enough to become the pilot? The only way he can do that is to want to move on, to embrace change, to be the 'man' upstairs. 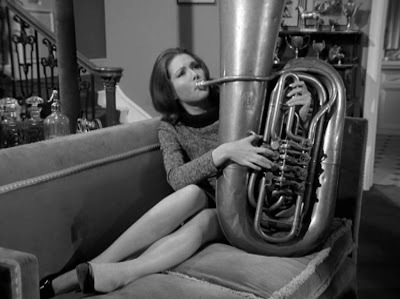 This can only come about when Sophie herself begins her journey to self-fulfilment under the Doctor's influence and finally when she is threatened by the 'man' upstairs too. 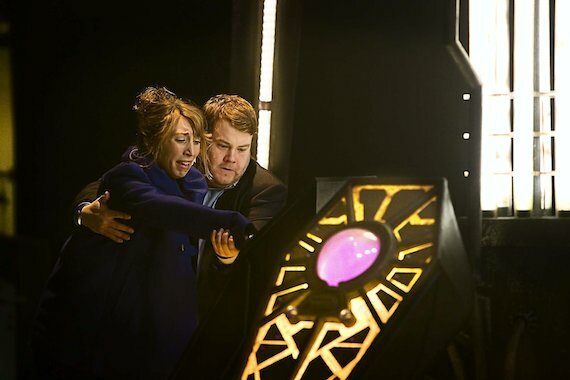 The episode succeeds through the three lead performances of Matt Smith, James Corden and Daisy Haggard. 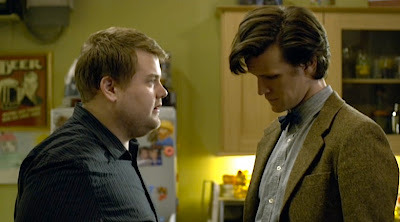 When he and the Doctor literally knock heads and Craig instantly discovers the Doctor's real identity and history, Corden's playing of Craig's reactions is amusing and well judged. I had my doubts about Corden but he confirms here that he's very much at home in drama and that frankly he should leave sketch shows, horror film pastiche and football punditry behind him. Where the episode falls down is in its conclusion. The 'love conquers all' solution to the threat from the time engine teeters over into tweeness and the threat is resolved in such as way that we are left with no real explanation of where it came from in the first place, reducing it to simply a device for articulating all of the character's inner desires. 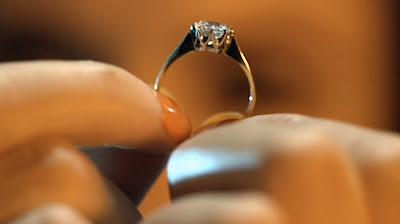 However, there is that interesting coda - about relationships found and lost - as Craig and Sophie are finally brought to their senses by the Doctor in contrast to Amy's discovery of the engagement ring and a relationship that has been wiped from time that leaves Amy and the audience asking any number of questions. 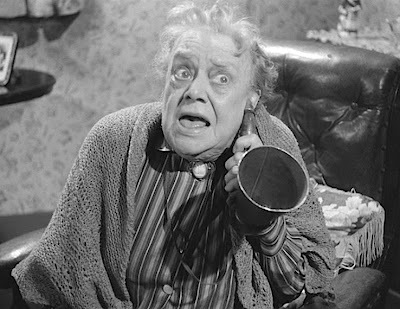 The 1950s is usually regarded as a time when British cinema devolved into a catalogue of films that either wallowed in a rose-tinted post-war nostalgia or took rather arch and regionalist comic pot-shots at insular local communities. A string of what appeared to be formulaic A and B pictures followed after a very rich period of British film experimentation - the Ealing films, Powell & Pressburger's vivid fantasies, David Lean's early literary adaptations amongst them - and during a period where most British actors skedaddled to Hollywood in pursuit of more lucrative work and fame. This view of the 1950s doesn't entirely ring true. Many of the formulaic A and B films of the period often hide their true colours and intentions beneath their apparently hackneyed exterior and many post-war B movies have as much to say about the aftermath of war and the changes in British society as their more legitmate cousins from the bigger studios. 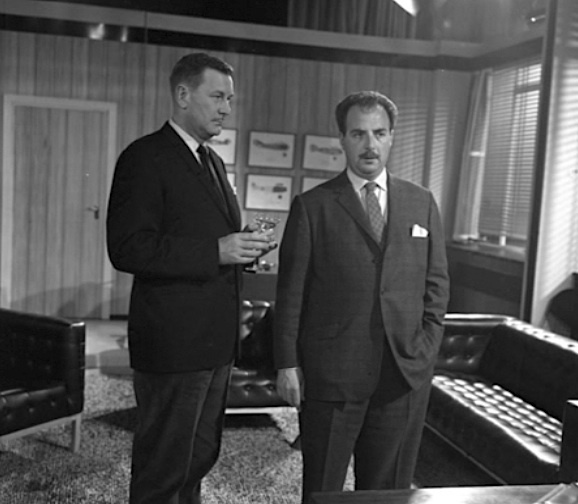 Adelphi Films was one of many British production and distribution companies operating during the 1940s and 1950s and produced well over 30 odd films. They made noirish thrillers, musicals, comedies and melodramas that featured many iconic British actors and personalities at the beginning of their careers. Sid James, Peter Sellers, Dora Bryan, Thora Hird, Diana Dors, Terence Alexander and many, many more. Adelphi made B pictures that would ordinarily form part of a traditional ‘double bill’ of a main feature and a supporting ﬁlm. Three hour programmes were the norm in cinemas at this time and Adelphi was one of many companies, among them Exclusive/Hammer, Merton Park, Butcher's Film Services, Tempean, Danziger Productions and New Realm that would produce supporting features to fulfill the demand. 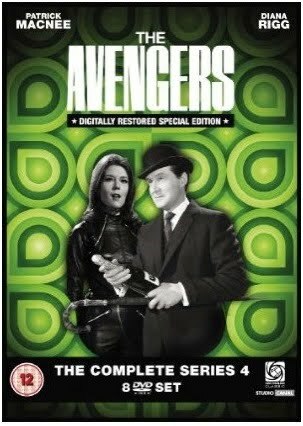 The bulk of the Adelphi Films collection is now held and preserved by the BFI and they are being restored in high-definition for DVD release. 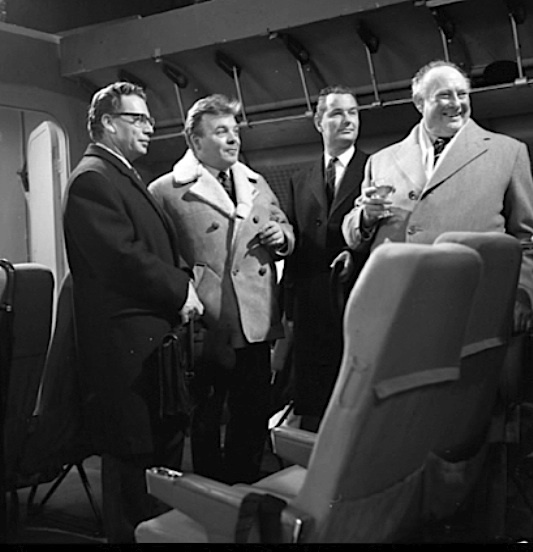 The BFI have already released two Adelphi features; Penny Points To Paradise and Let's Go Crazy, both early appearances for Peter Sellers. 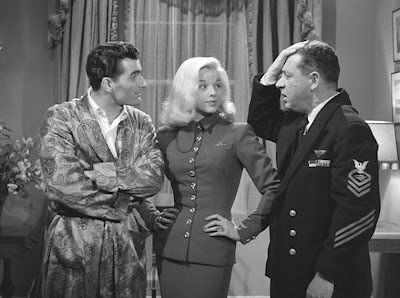 This month they release a double bill of Diana Dors films, made in 1952 and 1953 a few years before graduating to her more regarded roles in A Kid For Two Farthings and Yield To The Night. 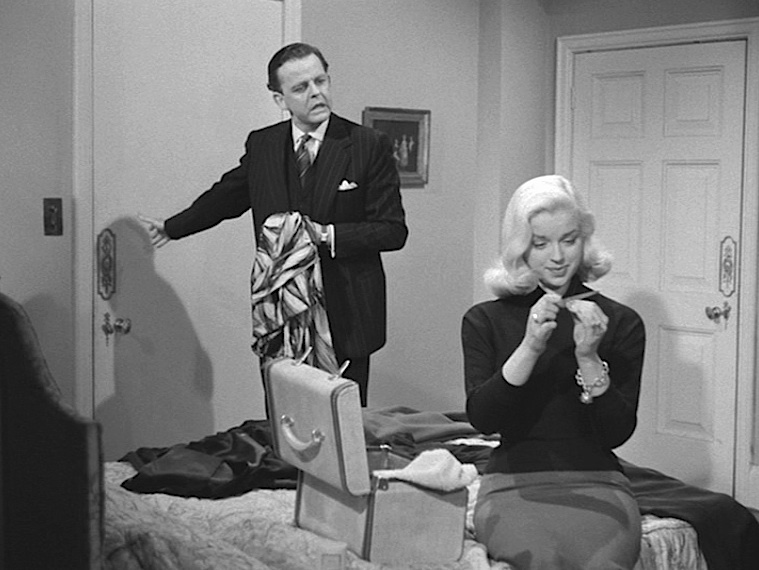 Dors was originally seen as the British 'blonde bombshell' equivalent of Jayne Mansfield, Marilyn Monroe and Jean Harlow but went on to prove that she was an actress of some significant talent. 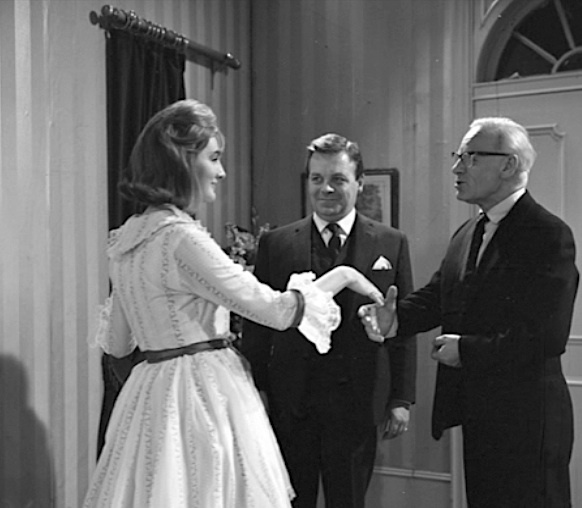 The British public regarded her as something of a national treasure and she was one of many British actors and personalities for which there was a great deal of affection and she is remembered as much for the many entertaining interviews she conducted on the chat show circuit of the early to late 1970s, the various television roles in the likes of The Two Ronnies (the Commader in the future satire The Worm That Turned), Queenie's Castle, Hammer's House Of Horror and The Sweeney. And who can forget her cameo in Adam Ant's Prince Charming video? The double bill opens with Is Your Honeymoon Really Necessary? 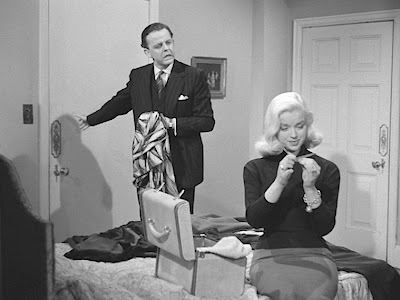 In this frothy bedroom farce scripted by Talbot Rothwell, who went on to write nineteen Carry On films, Dors plays Candy Markham, allegedly the ex-wife of American air-man Laurie Vining (Bonar Colleano - you'll probably recognise him from the Archer's A Matter Of Life And Death as he made a speciality of playing American servicemen in British pictures) who has arrived back in England with his new wife, Gillian. 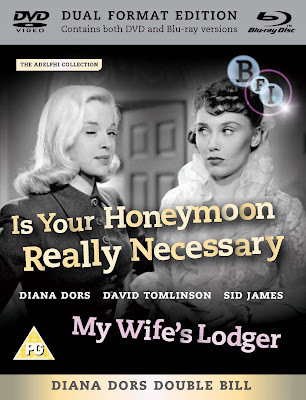 As they settle down to the first night of their honeymoon in a London hotel, Candy sets out to remind Laurie that technically she's still married to him and he's committing bigamy. Laurie turns to his batman Hank Hanlon (the redoubtable Sid James who is here already perfecting that iconic peal of laughter he's recognised for) and a seriously insecure lawyer Frank Betterton (a sweet performance from David Tomlinson who would later make a virtue out of his Britishness in Disney's Mary Poppins, The Love Bug and Bedknobs And Broomsticks) for help. What ensues is a series of farce elements as Laurie tries to hide fashion model Candy away in the spare room of the hotel suite to prevent his other wife finding out that she's, in effect, still wife number one; Candy mischievously refusing to accept a divorce and demanding that Laurie give her $5000 for her trouble; Candy pretending to be Laurie's wife (and Laurie claiming Gillian is his mother!) when he's forced into a briefing with Admiral Fields. 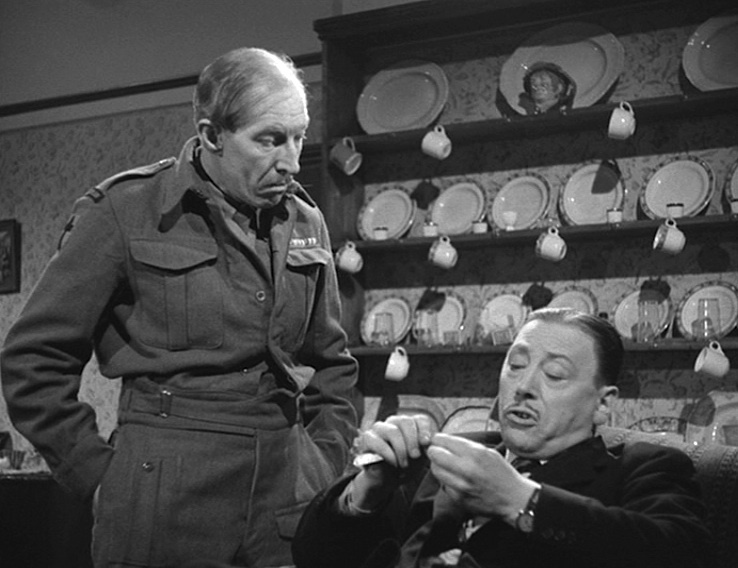 The film really hits it stride when both Dors and Tomlinson enter the fray; she as a sexually confident woman of the world and he a timid, insecure rather tight arsed British civil servant; and their comedic timing is rather effortless, confirming Dors' instinctive abilities in light comedies and Tomlinson's beautifully timed physical comedy as he bumbles and stumbles through the story. Gillian's ignorance of all the shenanigans going on does stretch the credibility of the various situations being played out in the various bedrooms of the suite but even she in the end rises to the occasion and cannily admits that she knows precisely what's going on. 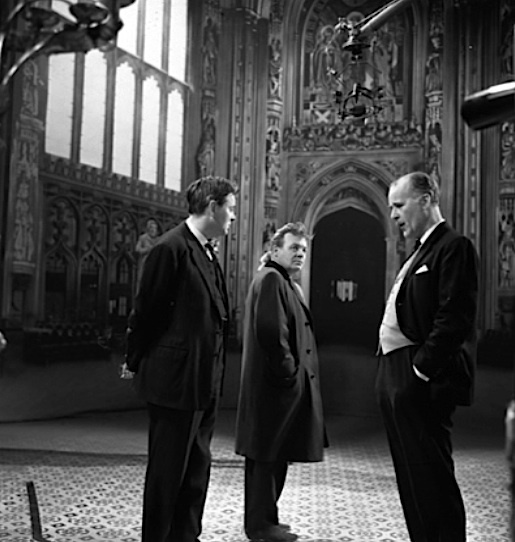 The laughs may be gentle but it's a delight to watch Dors and Tomlinson at work. 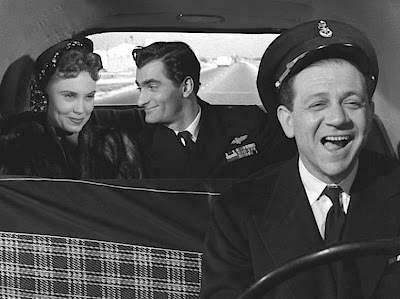 Beneath all the slapstick and gentle innuendo is the film's use of the three way relationship between Laurie, Gillian and Candy as an attempt to understand the special relationship between the US and Britain in the early 1950s. There is also an interesting contrast here between what eventually becomes a story about two couples - one American and one British - as Laurie's lawyer Frank, having to persuade Candy to go through with a divorce that will be recognised by the British legal system rather than the divorce he already has that's only valid in the US, then falls in love with her. At this point in time, the US was rolling out the Marshall Plan to aid the economic recovery of Europe from the devastation of the Second World War. 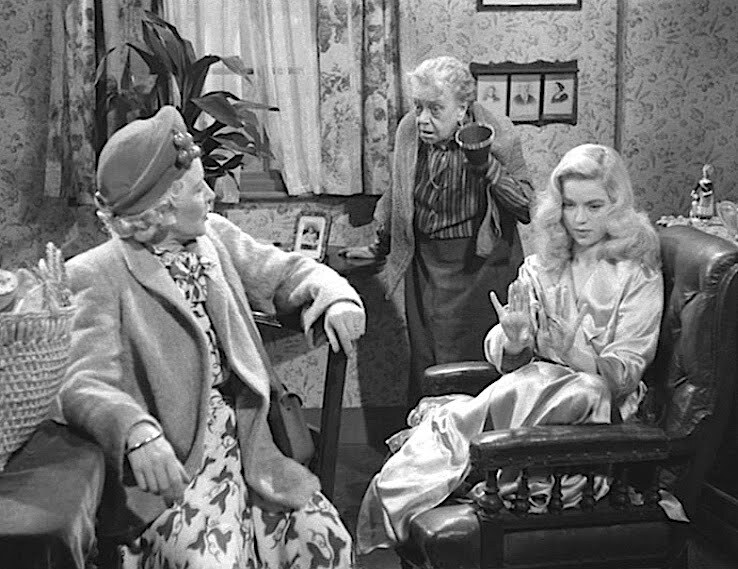 In effect, the film offers the idealised American couple of Laurie and Gillian to both the audience and to the singletons Frank and Candy as a vision of post-war 'you can be like us' Marshall Plan propaganda of how to culturally, economically and emotionally deal with the effects of war on both on the homefront and internationally. The focus on what could be seen as rather brash American characters with Laurie, Gillian, Hank and a transatlantic sounding Candy perhaps also echoes the kind of comedy that was already being popularised in The Honeymooners and I Love Lucy at the beginning of the 1950s. It's entirely possible that writer Rothwell could have seen some of these shows. The film ends by suggesting that Laurie is a serial womaniser, perhaps as a result of long periods spent in various countries during the war, and that Gillian is merely the latest in a line of brides whilst Candy and Frank's relationship suggests a transatlantic union actually based on monogamy. The second film on the double bill, My Wife's Lodger could at first be seen as a rather pale imitation of Hobson's Choice and certainly lacks any of the subtlety of David Lean's celebrated film. It is set in Lancashire and tells the tale of private Willie Higginbottom (music hall star Dominic Roche who also wrote the original play that film is based upon) returning to his humble home, hoping to be welcomed as hero of the war, only to find his wife Maggie (Olive Sloane) has taken in a lodger who has usurped his place in her heart. Roger, the lodger (wonderfully played by Leslie Dwyer), is in fact a rather underhand, coniving spiv and is planning to steal a lorry full of cigarettes. Diana Dors plays Willie's daughter Eunice and her concerns are with snagging an American soldier, wearing the latest fashion and going out dancing. She is in effect one of those 'teenagers' that 1950s culture was so obsessed about. 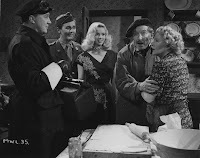 What on the surface seems to be a comedy of manners about the hapless Willie wishing for a hero's welcome and finding none available in home and hearth is actually a rather dark tale about what happened on the home front whilst the men were away fighting and what they would find on their return. The desire to come home and expect to continue where they left off was uppermost in the thoughts of most husbands but to return to find not only a young son and daughter fully grown and taking up adult pursuits of drinking, smoking and courting but also a wife who has taken in another man and with whom he must fight for her affections must have been pretty shocking. Whilst you can laugh at the music hall, often rather pantomime like, physical comedy here and heavy Northern accents that sound like someone running their nails down a blackboard, the situation reflects the vast changes that the war wrought upon traditional British domestic behaviour and social mores. The film surprisingly, and with some sensitivity, looks at the expectation that women, who had more or less run their families and gone out to work for the war effort, would return to domestic servitude once their husbands were back home. It's an interesting view of what working class families must have been faced with - a husband and former head of the household actually with no power over his wife and children and a wife whose attitudes have changed towards him - and including views on crime, law and order and the presence of American GIs on British soil. One of the key scenes is right at the beginning of the film where Willie and a small boy create complete havoc in a train carriage and one of the passengers yells at him, 'Haven't you grown up yet!'. It's part of a subtext in the film about children maturing into adults - namely Willie's son and daughter embracing their new found freedoms - and adults reduced to the state of children - Willie playing with toys he brought back for his kids and later his drunken wrecking of the home and Maggie's undisguised threat to run off with Roger and her demands to be upwardly mobile signifying their attempts to cope with the chaotic disruption of the war on adult married relationships. 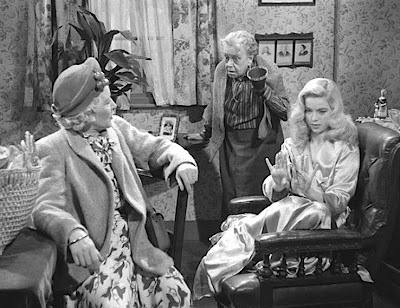 Dors is excellent as Eunice, providing a very naturalistic performance amongst a raft of slightly shrill and theatrical performances from Roche and Sloane where they clearly haven't altogether mastered the differences in acting on film and acting for the stage. They do come across as Northern caricatures rater than full bloodied characters. 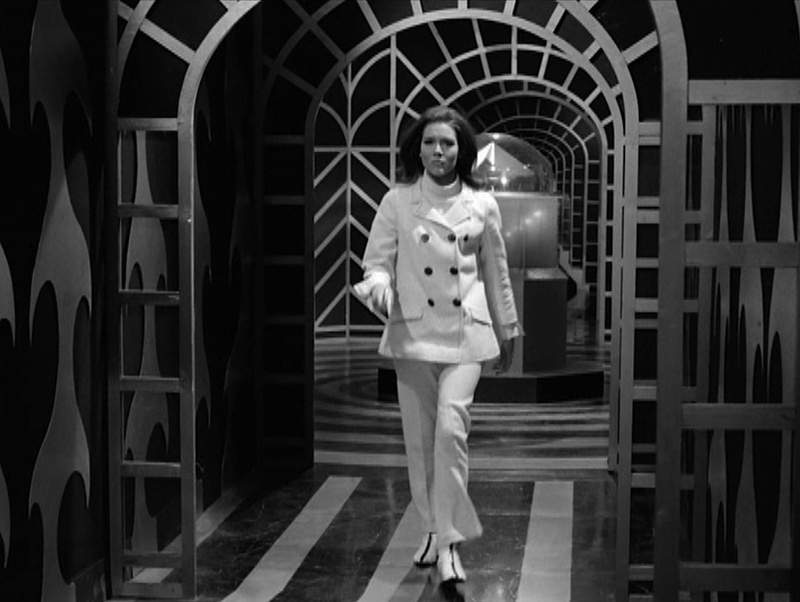 As for Dors, there just isn't enough of her in the film but she does at least show that she can sing and she's charming and glamorous throughout. One of the loveliest things is the triumvirate of the three leading female roles representing three generations of women affected by the war; Maggie as played by Sloane, Dors as Eunice and the wonderful Vi Kaley as the deaf mother-in-law sporting an ear trumpet and grumbling to great comic effect throughout the proceedings. 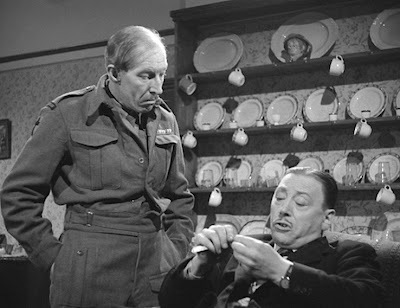 Leslie Dwyer is certainly the best of the male leads here and despite getting his comeuppance at the end of the film, his ducking and diving as the spiv is very entertaining. Alan Sedgwick plays the American GI hunk Tex who rather symbolises the dominance of American culture (also rather hilariously lampooned in the cinema programme that Roger and Maggie watch) and its freedoms in the post-war years and changes the lives of the Higginbottoms as the bearer of a legacy from the States that sees the entire family transformed into a Lancashire version of The Beverly Hillbillies. 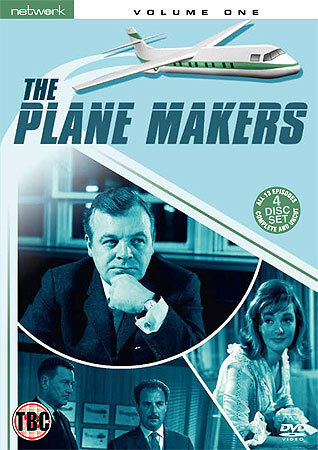 There are some genuinely laugh out loud moments here and the humour derived from the antics of such a dysfunctional family reflect many of the tropes that would find their way into British sit-coms of the late 1960s and 1970s where other ideological wars would be fought - based on gender, class, race and religion. Both films look immaculate and the restoration in hi-def is superb in these 1.33:1 transfers. There are occasional little scratches here and there but the picture is pretty much rock steady, full of real depth and contrast, with good detail, the requisite film grain and consistent blacks. Very impressive indeed and so lovely to see these rarely seen films looking so good and now available. 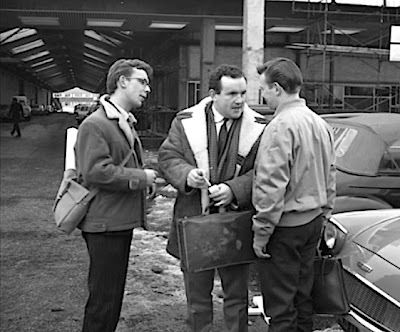 The PCM mono audio is perfectly serviceable apart from some heavy distortion when Dors gets to sing to Tex in My Wife's Lodger. The package comes with a superb illustrated booklet featuring original promotional materials and specially commissioned essays, including Diana Dors, My Mother by Diana’s son Jason Lake, David Tomlinson and I by David Tomlinson’s widow Audrey and That Diana Dors Moment by Damon Wise, author of Come By Sunday: The Fabulous, Ruined Life of Diana Dors.